Two extraordinary hand-made books have landed on my desk recently, one printed conventionally but written in the author's fluid calligraphy and illustrated from her field-journals, and the other entirely hand-made, even the paper. This is the story of four solitary retreats spent in a cabin in the Catskill Mountains of upstate New York. During these times I practiced sitting meditation and nature journaling. Both activities are contemplative, developing awareness and attentiveness to the world. I wanted to see how they might weave together when mixed with the simplicity and starkness of solitude. 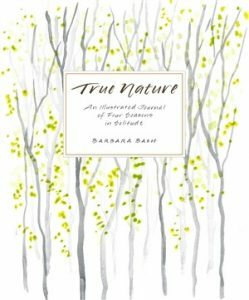 True Nature is simply beautiful, and as adventurous as the author finds herself to be. Sometimes the words become BIG, sometimes they dance around on the page, sometimes they stand out in bright colors. Bash is candid about the difficulties of her solitary retreats, the fears that rush in uninvited, including a debilitating fear of the dark discovered years before in her only previous solitary retreat. my heart ... beating fast, my breath high in my chest. Afraid of the dark. Afraid of what I can’t see. ... Relax the brow. Relax the mind. Sitting, watching, listening. Just as I step out of the woods, a bat banks and turns right in front of my face; its soft wings beat the air against my cheek. It feels like a salute. 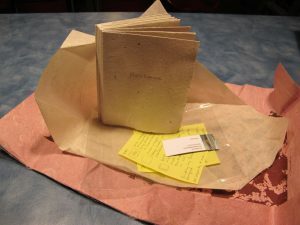 Resilience, Aimee Lee's handmade book, with its handmade wrappings and a key to the paper, along with a note from the artist. 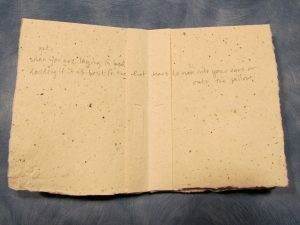 A two-page spread from Resilience, illustrating the careful word-placement on the rough-textured paper. A free-form poem written in pencil on just nine two-page spreads, Resilience is brief. But wise. And beautiful. So many words in the world. more than words course through your body. I read the key Aimee had included detailing what fibers each paper was made from and where it was made. And lay on the couch thinking that the world is full of such love and beauty and that sometimes we humans rise and embrace those qualities. Breaking our hearts open--intentionally or not--invites that goodness in, changing us in ways we cannot imagine. Thank you, Barbara and Aimee, for opening my heart in new ways. And thanks to you all for journeying with me.